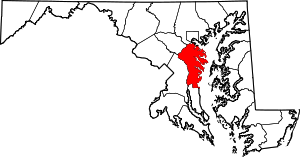 This is intended to be a complete list of the properties and districts on the National Register of Historic Places in Anne Arundel County, Maryland, United States. Latitude and longitude coordinates are provided for many National Register properties and districts; these locations may be seen together in a map. There are 103 properties and districts listed on the National Register in the county, including 12 National Historic Landmarks. (#84001328) 1761 Severn Chapel Rd. 39°02′20″N 76°38′59″W﻿ / ﻿39.038889°N 76.649722°W﻿ / 39.038889; -76.649722﻿ (Abington Farm) Millersville Farmhouse dates to about 1840; on the property are several important outbuildings. Riva Early and Middle Woodland periods base camp. (#69000060) Junction of Maryland Route 2, All Hallows' Church Rd., and South River Club Rd. 38°54′38″N 76°34′52″W﻿ / ﻿38.910556°N 76.581111°W﻿ / 38.910556; -76.581111﻿ (All Hallows' Church) Davidsonville Brick church with a hip roof constructed about 1710; Episcopal parish dates to 1682. 38°58′37″N 76°30′21″W﻿ / ﻿38.976944°N 76.505833°W﻿ / 38.976944; -76.505833﻿ (Annapolis National Cemetery) Annapolis One of the 14 national cemeteries established by Abraham Lincoln in 1862; part of the Multiple Property Submission for Civil War Era National Cemeteries. 38°58′43″N 76°37′37″W﻿ / ﻿38.978611°N 76.626944°W﻿ / 38.978611; -76.626944﻿ (Anne Arundel County Free School) Gambrills The only surviving schoolhouse erected in Maryland in response to the Maryland Free School Act of 1723; constructed between 1724 and 1746. 38°58′43″N 76°29′18″W﻿ / ﻿38.978611°N 76.488333°W﻿ / 38.978611; -76.488333﻿ (Artisan's House) Annapolis Frame dwelling from the 18th century; likely used as Revolutionary War barracks. Glen Burnie Remains of a prehistoric summer camp. (#05001443) 1418 East West Shady Side Rd. 38°51′07″N 76°30′43″W﻿ / ﻿38.851944°N 76.511944°W﻿ / 38.851944; -76.511944﻿ (Captain Avery Museum) Shady Side Frame dwelling constructed about 1860; expanded as the National Masonic Fishing and Country Club. 39°03′33″N 76°23′57″W﻿ / ﻿39.059167°N 76.399167°W﻿ / 39.059167; -76.399167﻿ (Baltimore Light Station) Gibson Island Privately owned caisson lighthouse in the Chesapeake Bay; first lit in 1908. 38°58′28″N 76°30′44″W﻿ / ﻿38.974444°N 76.512222°W﻿ / 38.974444; -76.512222﻿ (Wiley H. Bates High School) Annapolis High school for African Americans opened in 1932. Davidsonville Site with artifacts dating from the Late Archaic period through the Middle Woodland period. 39°01′25″N 76°34′57″W﻿ / ﻿39.023611°N 76.5825°W﻿ / 39.023611; -76.5825﻿ (Belvoir) Crownsville Brick, stone, and wood composite dwelling with sections possibly built as early as the 17th century. 39°11′23″N 76°39′17″W﻿ / ﻿39.189722°N 76.654722°W﻿ / 39.189722; -76.654722﻿ (Benson-Hammond House) Linthicum Greek Revival style, 19th century brick dwelling. 38°58′45″N 76°29′16″W﻿ / ﻿38.979167°N 76.487778°W﻿ / 38.979167; -76.487778﻿ (Brice House) Annapolis Georgian style brick house dating to 1792; now offices. (#84000034) Maryland Route 178 and Millersville Rd. 39°03′24″N 76°37′42″W﻿ / ﻿39.056667°N 76.628333°W﻿ / 39.056667; -76.628333﻿ (Bunker Hill) Millersville Large, eclectic, frame dwelling dating to 1820, with later 19th and 20th century additions. 38°47′59″N 76°35′47″W﻿ / ﻿38.799722°N 76.596389°W﻿ / 38.799722; -76.596389﻿ (Burrages End) Lothian Frame farmhouse dating to the 17th century. 38°58′38″N 76°29′24″W﻿ / ﻿38.977333°N 76.490056°W﻿ / 38.977333; -76.490056﻿ (John Callahan House) Annapolis Brick dwelling with unusual gable-end principal façade; relocated twice. (#69000061) North of Galesville off Cumberstone Rd. 38°51′37″N 76°32′56″W﻿ / ﻿38.860278°N 76.548889°W﻿ / 38.860278; -76.548889﻿ (Cedar Park) Galesville Dwelling originally constructed in 1702, with later 18th and 19th century additions; operated for a time as a girl's academy. 38°58′22″N 76°28′54″W﻿ / ﻿38.972778°N 76.481667°W﻿ / 38.972778; -76.481667﻿ (Chance Boatyard) Annapolis Former boat-building and repair complex built between 1913 and 1942. 38°58′52″N 76°29′21″W﻿ / ﻿38.981111°N 76.489167°W﻿ / 38.981111; -76.489167﻿ (Chase-Lloyd House) Annapolis Georgian brick mansion built 1769-1774 for Samuel Chase; now house museum. 39°03′23″N 76°38′56″W﻿ / ﻿39.056389°N 76.648889°W﻿ / 39.056389; -76.648889﻿ (Childs Residence) Millersville Former Post Office and community store built 1840-1852. 38°51′10″N 76°35′46″W﻿ / ﻿38.852778°N 76.596111°W﻿ / 38.852778; -76.596111﻿ (Christ Church) Owensville Small, board-and-batten church dated to 1869, and reputed to be by the noted church architect, Richard Upjohn. 38°58′41″N 76°29′29″W﻿ / ﻿38.978056°N 76.491389°W﻿ / 38.978056; -76.491389﻿ (Colonial Annapolis Historic District) Annapolis District encompassing the original town plan, surveyed in 1695, and about 120 18th century buildings. (#73000889) 160 Prince George St.
38°58′41″N 76°29′10″W﻿ / ﻿38.978056°N 76.486111°W﻿ / 38.978056; -76.486111﻿ (Patrick Creagh House) Annapolis A brick house with a steeply pitched gambrel roof originally built between 1735 and 1747. 39°03′34″N 76°37′43″W﻿ / ﻿39.059444°N 76.628611°W﻿ / 39.059444; -76.628611﻿ (Cross Roads Church) Millersville Frame Italianate and Carpenter Gothic-style church built in 1861. (#92000141) Along Maryland Route 214 east to its junction with Davidsonville Rd. 38°55′19″N 76°37′51″W﻿ / ﻿38.921944°N 76.630833°W﻿ / 38.921944; -76.630833﻿ (Davidsonville Historic District) Davidsonville District reflecting the village’s initial settlement in about 1835 through the early 20th century. 38°55′49″N 76°28′02″W﻿ / ﻿38.930278°N 76.467222°W﻿ / 38.930278; -76.467222﻿ (Douglass Summer House) Highland Beach Queen Anne style frame dwelling built in 1894-1895 by Major Charles Douglass, son of Frederick Douglass. Elkridge Site abandoned as a permanent village in the early 16th century. 39°05′13″N 76°42′32″W﻿ / ﻿39.086944°N 76.708889°W﻿ / 39.086944; -76.708889﻿ (Epiphany Chapel and Church House) Odenton Arts and Crafts style structure constructed in 1918 adjacent to Camp Meade (now Fort George G. Meade). 38°50′27″N 76°35′21″W﻿ / ﻿38.840750°N 76.589167°W﻿ / 38.840750; -76.589167﻿ (Evergreen) Owensville Federal style frame house dated to 1760. (#07001309) 13 SW 1st Ave.
39°09′54″N 76°37′39″W﻿ / ﻿39.165°N 76.6275°W﻿ / 39.165; -76.6275﻿ (First Avenue School) Glen Burnie Classical Revival structure built in 1899 and with an addition in 1917. Annapolis The last vestige of Annapolis Harbor fortifications dated to the early 19th century. 39°08′27″N 76°34′38″W﻿ / ﻿39.140833°N 76.577222°W﻿ / 39.140833; -76.577222﻿ (Freetown Rosenwald School) Glen Burnie African American Rosenwald school building built in 1924-25. 39°07′06″N 76°46′41″W﻿ / ﻿39.118333°N 76.778056°W﻿ / 39.118333; -76.778056﻿ (Grassland) Annapolis Junction Brick structure built in 1853 in a telescoping manner. 38°54′36″N 76°31′44″W﻿ / ﻿38.91°N 76.528889°W﻿ / 38.91; -76.528889﻿ (Gresham) Edgewater Frame dwelling built in the early 19th century. (#66000384) Maryland Ave. and King George St.
38°58′51″N 76°29′19″W﻿ / ﻿38.980833°N 76.488611°W﻿ / 38.980833; -76.488611﻿ (Hammond-Harwood House) Annapolis House designed 1773-1774 and based on plate in Andrea Palladio’s I Quattro Libri dell’Architettura, 1570; now house museum. (#75000865) East of Pasadena on Bayside Beach Rd. 39°08′06″N 76°26′49″W﻿ / ﻿39.135°N 76.446944°W﻿ / 39.135; -76.446944﻿ (Hancock's Resolution) Pasadena Stone house constructed originally in 1785, with later additions; open as house museum. 38°58′31″N 76°29′49″W﻿ / ﻿38.975278°N 76.496944°W﻿ / 38.975278; -76.496944﻿ (HELIANTHUS III (yacht)) Annapolis Yacht built by Nathanael Greene Herreshoff (1848–1938) in 1924; lost at sea in the 1990s. 38°43′30″N 76°33′59″W﻿ / ﻿38.725°N 76.566389°W﻿ / 38.725; -76.566389﻿ (Holly Hill) Friendship Original frame dwelling constructed in the fall or winter of 1698, later enclosed in brick with additions. House by the "Town Gates"
38°58′41″N 76°29′47″W﻿ / ﻿38.978056°N 76.496389°W﻿ / 38.978056; -76.496389﻿ (House by the "Town Gates") Annapolis Brick structure constructed in the second quarter of the 19th century as a single-family dwelling; now commercial space. 38°59′44″N 76°31′20″W﻿ / ﻿38.995556°N 76.522222°W﻿ / 38.995556; -76.522222﻿ (Howard's Inheritance) Annapolis Brick house constructed as early as 1760. 39°00′37″N 76°34′06″W﻿ / ﻿39.010278°N 76.568333°W﻿ / 39.010278; -76.568333﻿ (Iglehart) Iglehart Greek Revival-style frame house built about 1830. (#86000255) 1012 Mt. Airy Rd. 38°55′46″N 76°38′55″W﻿ / ﻿38.929444°N 76.648611°W﻿ / 38.929444; -76.648611﻿ (Indian Range) Davidsonville Gothic Revival country home built about 1852. Crofton Site from the Late Archaic period; part of Multiple Property Submission Prehistoric Human Adaptation to the Coastal Plain Environment of Anne Arundel County. (#69000062) Off Maryland Route 2 on Mill Swamp Rd. 38°53′09″N 76°35′47″W﻿ / ﻿38.885738°N 76.596300°W﻿ / 38.885738; -76.596300﻿ (Larkin's Hill Farm) Harwood Brick house built about 1753; the estate served as a temporary capital of Maryland in 1683. (#69000063) Northeast of Harwood on Mill Swamp Rd. 38°53′19″N 76°34′57″W﻿ / ﻿38.888611°N 76.5825°W﻿ / 38.888611; -76.5825﻿ (Larkin's Hundred) Harwood Brick house traditionally thought to have been built in 1704; likely constructed in the second quarter of the 18th century. (#06000451) Roughly bounded by Camp Meade Rd., Homewood Rd., Twin Oaks Rd., Locust Grove Rd., and Forest View Rd. 39°12′22″N 76°39′17″W﻿ / ﻿39.206111°N 76.654722°W﻿ / 39.206111; -76.654722﻿ (Linthicum Heights Historic District) Linthicum District encompassing a planned railroad suburb on the lines connecting Baltimore, Annapolis, and Washington, beginning in 1908. 38°59′56″N 76°40′15″W﻿ / ﻿38.998889°N 76.670833°W﻿ / 38.998889; -76.670833﻿ (Linthicum Walks) Crofton Farm complex including 19th century frame dwelling and tobacco barn. (#70000262) Northeast of Woodland Beach at the end of Londontown Rd. 38°56′30″N 76°32′25″W﻿ / ﻿38.941667°N 76.540278°W﻿ / 38.941667; -76.540278﻿ (London Town Publik House) Woodland Beach Former Colonial era tavern built between 1758 and 1764; now part of Historic London Town and Gardens. Pasadena Site includes several large outcroppings of quartzite and sandstone; part of Multiple Property Submission Prehistoric Human Adaptation to the Coastal Plain Environment of Anne Arundel County. Annapolis Middle-Late Woodland period site. (#69000064) Northeast of Harwood off Mill Swamp Rd. 38°52′27″N 76°35′08″W﻿ / ﻿38.874167°N 76.585556°W﻿ / 38.874167; -76.585556﻿ (Mary's Mount) Harwood Earliest portion built in 1771. 38°58′43″N 76°29′28″W﻿ / ﻿38.978611°N 76.491111°W﻿ / 38.978611; -76.491111﻿ (Maryland Statehouse) Annapolis Oldest state capitol in continuous legislative use, dating to 1772. 38°55′42″N 76°38′11″W﻿ / ﻿38.928333°N 76.636389°W﻿ / 38.928333; -76.636389﻿ (Mount Airy) Davidsonville Brick Georgian-Federal style dwelling built about 1857. 38°58′39″N 76°29′38″W﻿ / ﻿38.9775°N 76.493889°W﻿ / 38.9775; -76.493889﻿ (Mt. Moriah African Methodist Episcopal Church) Annapolis African American church structure; now houses Banneker-Douglass Museum. (#01000724) 1407 St. Stephen's Church Rd. 39°00′34″N 76°37′49″W﻿ / ﻿39.009444°N 76.630278°W﻿ / 39.009444; -76.630278﻿ (Mt. Tabor Good Samaritan Lodge No. 59) Crownsville African American benevolent society lodge constructed in 1899. (#01000373) 1421 St. Stephens Church Rd. 39°00′25″N 76°37′50″W﻿ / ﻿39.006944°N 76.630556°W﻿ / 39.006944; -76.630556﻿ (Mt. Tabor Methodist Episcopal Church) Crownsville African American church structure constructed in 1893. 38°58′36″N 76°29′11″W﻿ / ﻿38.976667°N 76.486389°W﻿ / 38.976667; -76.486389﻿ (CHESAPEAKE BAY BROGAN MUSTANG) Annapolis Chesapeake Bay brogan built in 1907. After sinking three times, it was reportedly moved to a museum in St. Michael's, MD, where it was reportedly destroyed in a storm. (#84001345) 5325 Muddy Creek Rd. 38°49′00″N 76°33′20″W﻿ / ﻿38.81653°N 76.55554°W﻿ / 38.81653; -76.55554﻿ (Norman's Retreat) Galesville Farm complex featuring early-19th century dwelling, and related outbuildings. (#01000820) 4566 Solomons Island Rd. 38°51′26″N 76°37′04″W﻿ / ﻿38.857186°N 76.617808°W﻿ / 38.857186; -76.617808﻿ (Oakwood) Harwood Frame tobacco plantation dwelling built in the 1850s. 38°53′27″N 76°36′17″W﻿ / ﻿38.890833°N 76.604722°W﻿ / 38.890833; -76.604722﻿ (Obligation) Harwood Dwelling begun in 1743 and later enlarged in 1827. 38°58′39″N 76°29′32″W﻿ / ﻿38.9775°N 76.492222°W﻿ / 38.9775; -76.492222﻿ (Old City Hall and Engine House) Annapolis Brick building built 1821-1822 by the City of Annapolis; now commercial space. Rose Haven Shell midden and is 2,000 feet (610 m) long by 300 feet (91 m) wide. 38°57′58″N 76°36′22″W﻿ / ﻿38.966111°N 76.606111°W﻿ / 38.966111; -76.606111﻿ (OLIVER'S GIFT (log canoe)) Davidsonville Chesapeake Bay log canoe built in 1947. 38°48′07″N 76°39′52″W﻿ / ﻿38.801944°N 76.664444°W﻿ / 38.801944; -76.664444﻿ (James Owens Farm) Bristol Large mid-19th century brick late Greek Revival/Italianate dwelling and related outbuildings. (#03001117) Owensville Rd. and Owensville-Sudley Rd. 38°51′00″N 76°35′37″W﻿ / ﻿38.85°N 76.593611°W﻿ / 38.85; -76.593611﻿ (Owensville Historic District) Owensville District consisting of 27 buildings constructed between 1825 and 1875. (#71000364) 186 Prince George St.
38°58′47″N 76°29′18″W﻿ / ﻿38.979722°N 76.488333°W﻿ / 38.979722; -76.488333﻿ (Paca House and Garden) Annapolis Large Georgian style home built between 1763 and 1765; now house museum. 38°51′23″N 76°32′29″W﻿ / ﻿38.856389°N 76.541389°W﻿ / 38.856389; -76.541389﻿ (Parkhurst) Harwood Gothic Revival dwelling constructed about 1848-1850, with later alterations. (#71000365) 5 St. John's St.
38°58′49″N 76°29′32″W﻿ / ﻿38.980278°N 76.492222°W﻿ / 38.980278; -76.492222﻿ (Pinkney-Callahan House) Annapolis Name of brick dwelling prior to move in 1972; now known as John Callahan House and located on Conduit Street. 38°47′22″N 76°38′22″W﻿ / ﻿38.789444°N 76.639444°W﻿ / 38.789444; -76.639444﻿ (Portland Manor) Lothian Frame dwelling constructed in 1725; enlarged about 1790 and about 1850. 38°57′37″N 76°30′11″W﻿ / ﻿38.960278°N 76.503056°W﻿ / 38.960278; -76.503056﻿ (Primrose Hill) Annapolis Mid-18th century Georgian brick house; home of American portraitist, John Hesselius. 38°52′16″N 76°37′34″W﻿ / ﻿38.871047°N 76.626053°W﻿ / 38.871047; -76.626053﻿ (Richland) Harwood Frame, hipped roof dwelling built about 1893. 39°02′54″N 76°36′53″W﻿ / ﻿39.048333°N 76.614722°W﻿ / 39.048333; -76.614722﻿ (Rising Sun Inn) Millersville Frame dwelling dating to about 1753. (#87000852) 2403 Bell Branch Rd. 38°59′00″N 76°39′30″W﻿ / ﻿38.983333°N 76.658333°W﻿ / 38.983333; -76.658333﻿ (Rosehill) Gambrills Property of 17 acres (69,000 m2) of partially wooded and cleared land on which are located a dwelling and six outbuildings. 38°47′23″N 76°35′55″W﻿ / ﻿38.789722°N 76.598611°W﻿ / 38.789722; -76.598611﻿ (St. James Church) Tracys Landing Episcopal parish established in 1692; present church completed in 1765. 39°01′32″N 76°36′01″W﻿ / ﻿39.025556°N 76.600278°W﻿ / 39.025556; -76.600278﻿ (St. Paul's Chapel) Crownsville Frame Episcopal church dating to about 1865. 39°00′52″N 76°23′58″W﻿ / ﻿39.014444°N 76.399444°W﻿ / 39.014444; -76.399444﻿ (Sandy Point Farmhouse) Sandy Point Five part brick house constructed about 1815. 39°00′57″N 76°23′06″W﻿ / ﻿39.015833°N 76.385°W﻿ / 39.015833; -76.385﻿ (Sandy Point Shoal Light Station) Skidmore Lighthouse on a caisson foundation erected in 1883; in 2006 it was sold at auction. (#09001093) 6243 Shady Side Rd. 38°58′30″N 76°29′26″W﻿ / ﻿38.975°N 76.490556°W﻿ / 38.975; -76.490556﻿ (Upton Scott House) Annapolis Georgian style brick dwelling built about 1762. Harwood Site of the 1664 patent "The Addition," which was issued in December 1662 to George Skipworth; part of the Multiple Property Submission for Quaker Sites in the West River Meeting, Anne Arundel County, Maryland c. 1650-1785. (#69000067) West of South River on South River Club Rd. 38°54′21″N 76°33′51″W﻿ / ﻿38.905833°N 76.564167°W﻿ / 38.905833; -76.564167﻿ (South River Club) South River Structure built in 1742; home to the oldest continuously operating social club in America. (#83003627) 92 W. Washington St.
38°58′48″N 76°29′47″W﻿ / ﻿38.98°N 76.496389°W﻿ / 38.98; -76.496389﻿ (Stanton Center) Annapolis Former school for African Americans built in 1893; now community center. 38°58′52″N 76°29′14″W﻿ / ﻿38.981111°N 76.487222°W﻿ / 38.981111; -76.487222﻿ (Peggy Stewart House) Annapolis Georgian style house built between 1761 and 1764. (#73000895) North of Deale off Maryland Route 468 on Old Sudley Rd. 38°49′15″N 76°34′18″W﻿ / ﻿38.820833°N 76.571667°W﻿ / 38.820833; -76.571667﻿ (Sudley) Deale Frame dwelling originally built as grand hall-chamber style of the 1720-1730 period. 38°55′15″N 76°36′25″W﻿ / ﻿38.920833°N 76.606944°W﻿ / 38.920833; -76.606944﻿ (Summer Hill) Davidsonville Frame farmhouse of the mid 19th century. 39°12′32″N 76°38′00″W﻿ / ﻿39.208889°N 76.633333°W﻿ / 39.208889; -76.633333﻿ (Sunnyfields) Linthicum Brick and frame house with sections built as early as 1785. 38°53′55″N 76°26′10″W﻿ / ﻿38.898611°N 76.436111°W﻿ / 38.898611; -76.436111﻿ (Thomas Point Shoals Light Station) Annapolis Lighthouse built in 1873; not automated until 1986. 38°46′55″N 76°35′29″W﻿ / ﻿38.781944°N 76.591389°W﻿ / 38.781944; -76.591389﻿ (Tracy's Landing Tobacco House No. 2) Tracy's Landing Tobacco barn built in 1805. (#70000261) 4621 Muddy Creek Rd. (#79001109) 106 W. Maple Rd. 39°12′21″N 76°39′17″W﻿ / ﻿39.205833°N 76.654722°W﻿ / 39.205833; -76.654722﻿ (Turkey Hill) Linthicum Frame and field stone dwelling built about 1825. (#86000670) 5910 Oak Twin Ct.
39°12′36″N 76°39′10″W﻿ / ﻿39.21°N 76.652778°W﻿ / 39.21; -76.652778﻿ (Twin Oaks) Linthicum Brick Greek Revival influenced dwelling constructed in 1857. 38°58′47″N 76°29′49″W﻿ / ﻿38.97967°N 76.49703°W﻿ / 38.97967; -76.49703﻿ (Universal Lodge No. 14) Annapolis Built c. 1880, purchased in the 1940s by an African American Masonic lodge (which was founded in 1865 by a group of African American civilian employees of the U.S. Naval Academy), and renovated for use as a lodge meeting hall. 39°11′59″N 76°34′02″W﻿ / ﻿39.199722°N 76.567222°W﻿ / 39.199722; -76.567222﻿ (U.S. Coast Guard Yard Curtis Bay) Glen Burnie Shipyard located on Curtis Bay; it is the Coast Guard's sole shipbuilding and major repair facility. (#66000386) Maryland Ave. and Hanover St.
38°59′02″N 76°29′14″W﻿ / ﻿38.983889°N 76.487222°W﻿ / 38.983889; -76.487222﻿ (U.S. Naval Academy) Annapolis Founded as the Naval School in 1845 by Secretary of the Navy George Bancroft; located at the former U.S. Army post Fort Severn. (#66000387) Off St. Margaret's Rd. 39°00′15″N 76°25′37″W﻿ / ﻿39.004167°N 76.426944°W﻿ / 39.004167; -76.426944﻿ (Whitehall) Annapolis Brick plantation house built about 1760. (#03001115) 937 to 987 Patuxent Rd. and 2811 to 2825 5th Ave.
39°03′07″N 76°44′08″W﻿ / ﻿39.051944°N 76.735556°W﻿ / 39.051944; -76.735556﻿ (Woodwardville Historic District) Woodwardville District consisting of 16 historic structures, most of which are located adjacent to Patuxent Road. Wikimedia Commons has media related to National Register of Historic Places in Anne Arundel County, Maryland. This page was last edited on 15 December 2018, at 04:39 (UTC).